Great Location in Killarney with private outdoor courtyard with seating area. 3 minute walk to town centre. 2 spacious twin bedrooms both en-suite with power showers. 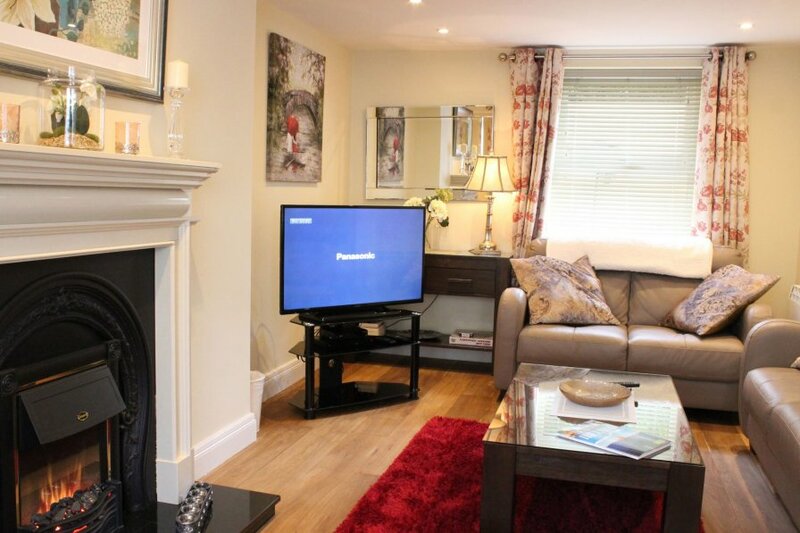 Living room with leather seating, Electric fireplace, flat screen TV (UK Channels)with DVD. wooden floor. A fully fitted kitchen with modern appliances and electric coffee machine. All utility bills are included in the price. Free off street parking to the rear plus free Wi-fi. Killarney has a dazzling array of entertainment opportunities for all ages and to suit all interests. The town and it's surrounds boast an abundance of lively nightspots. Whether you like a quite tipple or enjoy music and a spot of dancing. killarney is home to many excellent hostelries. Killarney's top-class entertainment venues include Ireland's National Event Centre where world-class acts take center stage all year round. Playgrounds and play areas, both inside and out, as well as Killarney Sports & Leisure Center. killarney Outlet Centre is directly across from this town house. One of Ireland's most popular visitor attractions, the world-renowned Muckross House & Gardens is a must-visit. This magnificent Victorian mansion forms the centrepiece of the equally renowned Killarney National Park. The nearby Muckross Traditional Farms are full working examples of rural life in the 1930s. St Mary's Cathedral in the town centre was designed by the famous neo-Gothic designer Augustus Welby Northmore Pugin in the 19th century. Killarney offers activities to suit all ages and dispositions, from outdoor adventures to those who like a gentle stroll. The more adventurous can take on the 3000-feet plus summits of the iconic MacGillicuddy Reeks. Exploring the National Park by bicycle, on foot or by jaunting car is highly recommended while a trip on the Lakes of Killarney by water us or boat is a must. A golfer's paradise, Killarney has hosted the prestigious Irish Open four times. Killarney is also a real spa capital, as well as being the destination of choice for adventure sports enthusiasts. Equine pursuits, from trekking to horse-riding lessons, also abound. Private enclosed courtyard. Free enclosed parking available to the rear of the property.